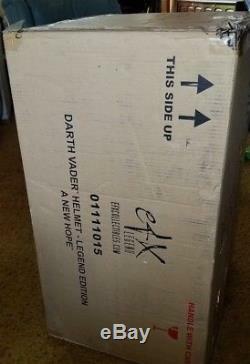 EFX Darth Vader Helmet ANH LEGEND Edition. VERY desirable double digit edition number. 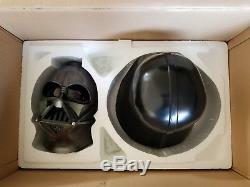 This is the finest most accurate Vader made and has a direct lineage to the original screen used ANH helmet. 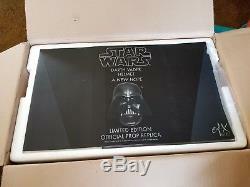 It is sourced from the original Rick Baker Molds taken from the screen used helmet after the filming of ANH. The helmet features an accurate two tone hand painted paint scheme just like the screen used helmet. The Legend edition maintains all of the surface imperfections and nuances as seen in ANH. 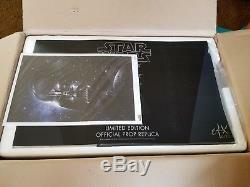 Exclusive Tsuneo Sanda ACME art print made especially for the Legend Edition. Comes 100% complete with all paperwork and COAs and display base. 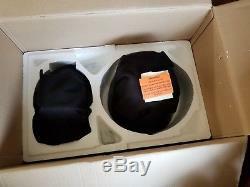 The original sealed box was only opened to check the quality and to take these pictures. The original Darth Vader helmet, as seen in Star Wars Episode IV: A New Hope. Sculpted by Brian Muir based on the concept sketches by beloved illustrator Ralph McQuarrie. Even though there were 3 known castings made from the mold made from Muir's sculpt, only 1 helmet was used in the entire filming of A New Hope. 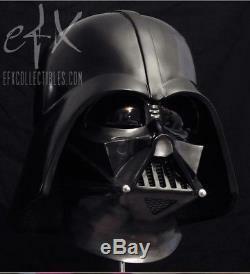 The EFX master pattern was cast from vintage molds in the Lucasfilm archives which are believed to have been made by none other than Rick Baker from the screen used Vader helmet back in 1977. What makes this a very special product is that the master pattern is NOT made from a digital scan, it is an actual, original casting. This means that this replica helmet will have direct lineage to the original and be as true to the actual filming prop as you can possibly get. This helmet has the asymmetric geometry that many feel capture the true evil essence of Darth Vader. The face mask will have the screen accurate two-toned black and gunmetal applied paint scheme. This is a stunning piece, for the true Vader connoisseur. What you see in the pictures is exactly what you will get. The item "EFX Star Wars ANH DARTH VADER LEGEND Edition Helmet 11" is in sale since Monday, August 20, 2018. This item is in the category "Collectibles\Comics\Figurines". 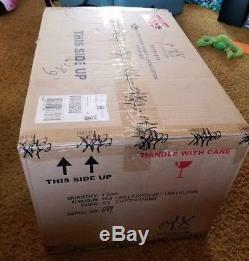 The seller is "galactica_cag" and is located in Federal Way, Washington.